After our recent trip to Timor-Leste's border territory close to neighbouring Indonesia to show "Balibo" in Balibo, last week we headed west again: this time to the high mountains of the country's interior, to Ainaro, Same and Aileu. This is the part of the country where much of Timor-Leste's famous organic coffee is grown, and where the highest peak, Mt. Ramelau punches through the clouds to soar 2,963 metres above the majestic scenery of the surrounding districts. 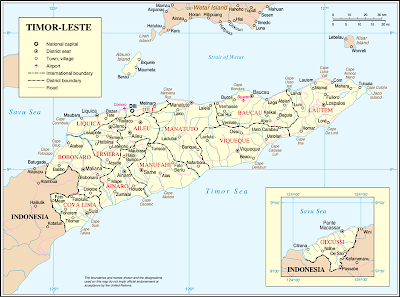 The climate in this part of Timor-Leste is markedly different from that of the coastal strip: it's cool - even cold, at some times of year - and the wet season comes early. The signs of seasonal change were already evident in Ainaro, which was shrouded by fog on the day of the screening. The weather did not deter the people of Ainaro. Excitement was running high as we set up our equipment. Local youngsters offered to help us to put up the big screen, impatient to see the start of the evening's programme. A 1,400-strong crowd packed into the Town Square to watch the Jackie Chan movie, "The Karate Kid". At the end, nobody wanted to move: the moviegoers asked for the Timorese short comedy film, "Vagabond", written and directed by Bety Reis, to be shown again. Encore! The local authorities in Ainaro were so happy with the event, they said that they hoped that Cinema Lorosa'e would return for more screenings. Then it was time to set out for a drive through stunning mountain scenery for the show in Same. In Same, the screening took place in the basketball court at the Catholic school with a crowd of 900 people. We travel with a selection of films and usually let the community choose what they'd like us to show. In Same, we had suggested "Bend It Like Beckham", as soccer is hugely popular in Timor-Leste. But Jackie Chan is even more popular, following his 2008 visit to the country, and the people of Same requested "Karate Kid". Local authorities also approved of the choice of movie; Timor-Leste has had its share of trouble from so-called "martial arts gangs" - often young people are drawn to the "art" of fighting but are not indoctrinated in the philosophy and strict discipline to go with the moves. Same's community leaders said that they liked the film because that it shows the proper practice of martial arts and acts as a vehicle for Jackie Chan's message of peace; a good example for Timorese youth. One of the key objectives of Cinema Lorosa'e is to offer wholesome entertainment to young people who sometimes suffer from boredom in remote rural areas in this developing country. As Timorese youth leader Jose Kai Lekke Sousa-Santos puts it: "It offers the opportunity to behave like youths from all over the world, to go on dates, to go out with friends to a film, to do normal activities that youths their age enjoy the world over. Most importantly it gives them a different option to the dangers of street drinking and violence". "Cinema offers a window on the world, a world of culture and values that promises to transport the families of Timor-Leste beyond the everyday experience of life. As an institution dedicated to promoting tolerance and a culture of peace, UNESCO and its Timor-Leste National Commission wholeheartedly supports the initiative of open-air movie screenings, particularly for the least accessible communities of Timor- Leste". As we took the winding mountain road to our next destination, Aileu, the clouds started to build up. But the threat of rain did not dampen the enthusiasm of the young people here. We were somewhat apprehensive about the effects of an impending downpour on the projection equipment but we went ahead anyway after the youngsters of Aileu promised to help us scramble to protect it should the heavens open. But that promise came with a condition: we had to screen the Brazilian film "Os 2 Filhos de Francisco", a Portuguese-language musical movie. The country-style songs from the film are especially popular here, although the community had never had a chance to actually see the movie. So we threw caution to the winds and set up the apparatus on the community soccer field, which was soon filled with a 2,600-strong crowd. Throwing caution to the winds: "Let's set up anyway"
Full house, despite a "heavy dew"
The expected downpour did not materialise although the audience was certainly bathed in a heavy "mountain dew"; the equipment was unscathed. Judging by the comments after the show, the people of Aileu were not put off by the uncomfortable weather: they begged us not to leave, to stay one more night and to keep the Cinema Lorosa'e programme running in the future. When we receive feedback like that, it makes all of the long, hard miles on the road, the packing and unpacking of equipment and the relentless schedule totally worthwhile. And it certainly was a long haul back to Dili, where we arrived at 2am on Friday (October 14th) ready to set up for our "Balibo-a-thon" - three straight nights of "Balibo" screenings at the Sunset Fair and Government House. It seems that Timorese and expat residents alike simply can't get enough of this marvellous film. 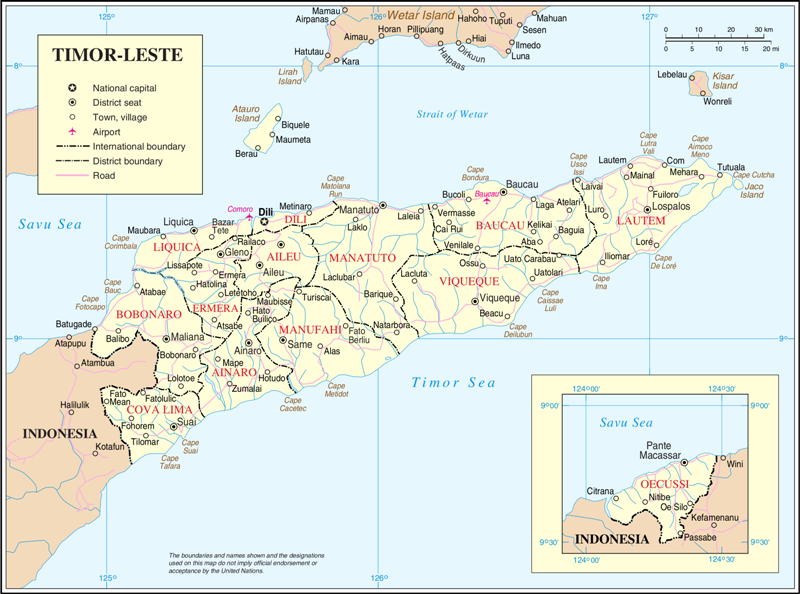 After a busy "Balibo" weekend, there's no rest, with preparations to be made for three nights of screenings in the remote Timor-Leste "exclave" of Oecusse: a district situated in West Timor, surrounded by Indonesian territory on three sides. We'll be taking Cinema Lorosa'e to Oecusse by ferry - our first time at sea - and giving a rare treat to local people with movie shows on Tuesday, Wednesday and Thursday evenings (October 18-20th). It's a long voyage, so this week there will be NO Cinema Lorosa'e screening at the Sunset Fair, although we will be showing "Thor" and "How To Train Your Dragon" at Government House on Saturday and Sunday (October 22-23) respectively. Then we'll be off to the districts again, this time to Ermera (October 25th), Maubara (October 26th) and Liquica (October 27th) before heading east to Los Palos (November 8th), Foiluru (November 9th) and Baucau (November 10th). We'll wrap the Cinema Lorosa'e season up with a trip to Tutuala on November 14th and a special screening at the orphanage at Laga. Every weekend, there will be the usual screenings at Sunset Fair and Government House. Watch this space for programme details.